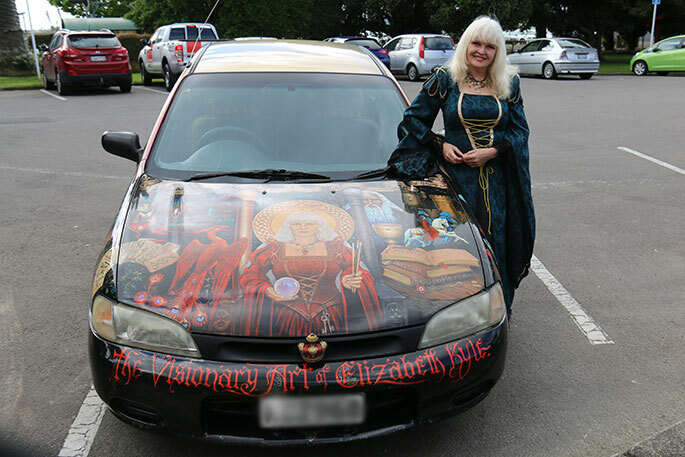 Visionary artist Elizabeth Grainger with her car masterpiece, which took her five months to paint. Photos: Sharnae Hope. Elizabeth Grainger’s natural flair for visionary art came to her in a lucid dream. At six-years-old, while hiding out in native bush in her home town of Katikati, she had a spiritual awakening. In a space of forest protection, she suddenly found herself being cuddled on the lap of a spiritual Maori mother. Since then, the 67-year-old visionary surrealist has had many lucid visions, which have slowly transformed her art to its current form today. 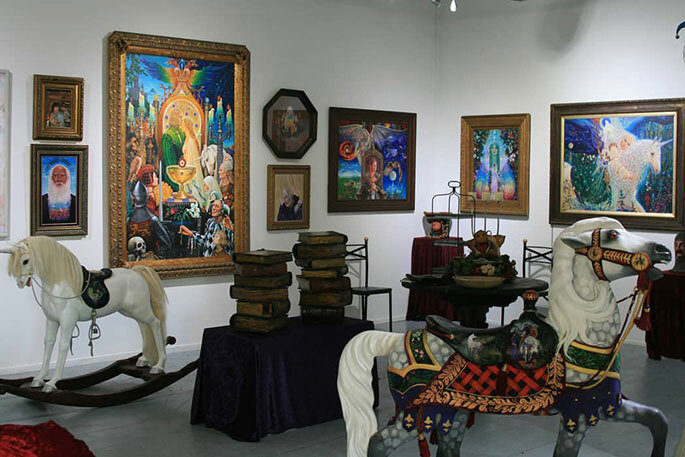 In her latest exhibition, The Visionary Art of Elizabeth Grainger Kyle, many of her spiritual awakenings will be showcased through 70 pieces from her private collection. The exhibition, from 1973 until now, will showcase a range of magical, mythical and medieval elements with Maori and Celtic symbolism, which relates to Elizabeth’s heritage. The art space is also an art piece in itself, with a Medieval Castle theme. She says she had a near death experience in 1983, and came to a fork in the road where she developed a more global view by looking into her Celtic heritage. One of her signature paintings, White Wind, depicts a young girl resting on a unicorn. Elizabeth says the image in her mind revealed itself like a jigsaw puzzle - a small piece each day on an otherwise blank canvas. “It has been on prints and greeting cards for around 20 years,” she explains, “and many people come up to me telling me the connection that they had with the painting and how it got them through their teenage years. Some said they’d had the print since the age of 10. Born in 1951, Elizabeth grew up on a dairy farm and attended Katikati Primary School. She then boarded in Tauranga during the week to attend Tauranga Girls’ High School. After high school she majored in Painting and Industrial Design at Auckland’s Elam Art School. Since then she has owned several visionary art galleries in Melbourne, the Gold Coast and Ballarat. She says she aims to find a castle which will become an inspiring sanctuary away from the mundane and sometimes overly busy world we live in. 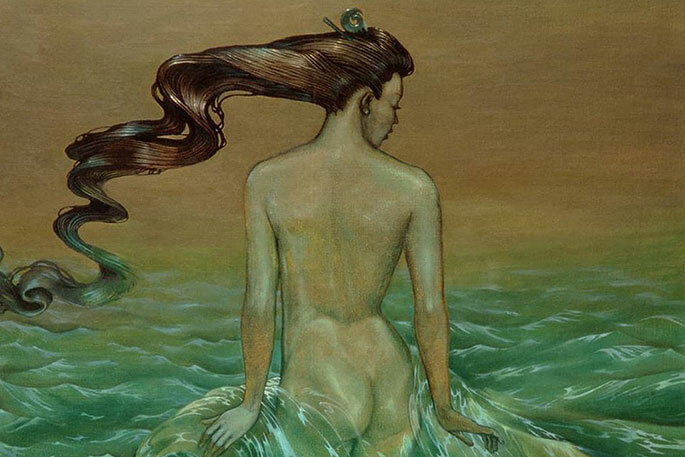 The Visionary Art of Elizabeth Grainger Kyle runs until October 27 at the Zeus Gallery at 35 Chapel Street. Members of the public are encouraged to wear medieval clothes.